Carlo Ancelotti warned that his work in English football has only just begun as he savoured clinching the Premier League title at the first attempt. Ancelotti?s Chelsea clinched the championship for the first time since Jose Mourinho led the club to back-to-back triumphs in 2005 and 2006 with a crushing 8-0 defeat of Wigan on Sunday. The victory meant Chelsea finished one point ahead of Manchester United and broke Sir Alex Ferguson?s team's three-year hold on the title. In doing so, the Blues scored 103 league goals, becoming the first club to pass the century mark during a Premier League season while Didier Drogba?s second half hat-trick ensured the Ivorian took his personal tally to 29 goals to collect the Golden Boot award ahead of United?s Wayne Rooney. And Ancelotti believes there will be more success to come from this squad despite the significant number of players who are now over thirty. The Italian was delighted with the way his squad responded to the pressure of having to win their final match, albeit against a Wigan side seriously depleted by injuries and with one of the worst away records in the division. "We played a good match and won, and that was our aim. To win this game and close this title. We are very happy and I want to say a lot of thanks: to my owner, Roman Abramovich; to my club and everyone who worked with me in this season, supporting me every day; and above all my players. "I found a fantastic team here who worked very well every day, maintaining a good atmosphere as a team. We won this title because we played as a team and worked as a team, everyone. "Not only the players. Everyone at the club who was involved this season wanted to win this title and, in the end, everyone did a fantastic job. "It?s a fantastic moment. I?m happy to have done this in my first season. I had a lot of help because I found a team and a club with fantastic organisation. So it was easy for me to do my best." Ancelotti said home and away wins over United had been the foundation for his side's triumph. "They were the key for this title because that improved our confidence and sent United a little bit down," he said. Chelsea's focus will now turn to next weekend?s FA Cup final when they can complete a league and cup double for the first time in the club?s history by beating Portsmouth. Then the manager will review his playing staff and sit down with club owner Roman Abramovich and other officials to discuss his summer transfer plans. "For now, we have time to think about this," added the Italian. "We will take decisions about the future together, how we did this season. I think this team doesn?t need to change a lot of things. Every player did a fantastic job this season." 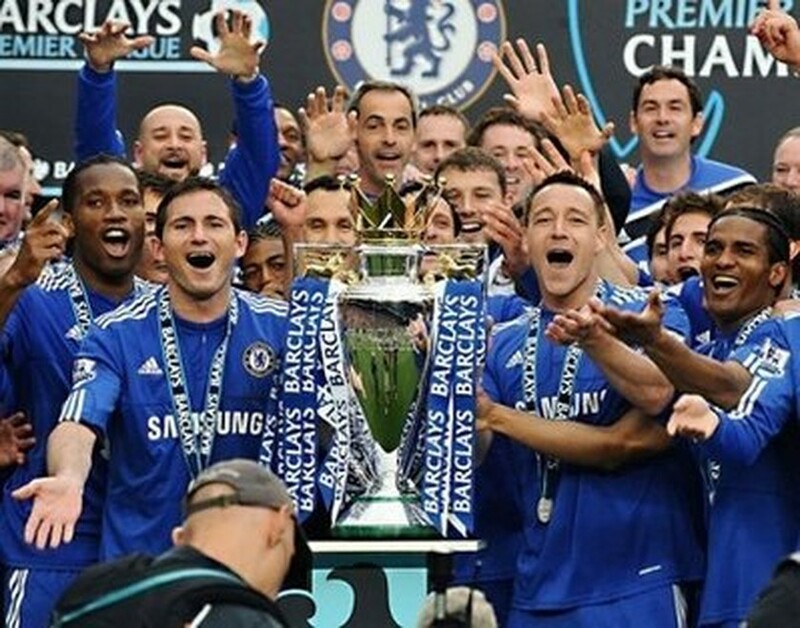 Midfielder Frank Lampard, scorer of Chelsea?s second goal from the penalty spot, insisted this title triumph equalled the success the club enjoyed under Mourinho. "It's right up there, the way we?ve done it and finished the season in such style," said the England international. "It's been fantastic. We deserved to come out on top in the end. We?ve had little ups and downs along the way. "The first two titles we won relatively easily. They were very special because they were the first ones, but with the difficulties we?ve had this year, that was very special." Skipper John Terry admitted that last three years have been painful for Chelsea as United asserted their supremacy over the English game. "This feels magnificent," said the defender. "It's been three hard years seeing Manchester United lift it. We've got it back now and we need to do what Man Utd have done and maintain it for a few years. It's been up and down all year, it's been really tough." Wigan boss Roberto Martinez said Chelsea were worthy champions. "Normally the table doesn?t lie and look at the record Chelsea have at home, with only one defeat," the Spaniard said. "You look at the amount of goals they have scored- they perform in style. Normally over 38 games the right teams win."